Globally, what were the coldest 300 years since civilisation? In the past 10,000 years? What were the warmest and what were the coldest and how do they compare to the 21st century. It's an interesting question and one to which there doesn't seem to be a definitive answer. The best answer looks to be the coldest 300 years in the Little Ice Age. There have not been a lot of attempts to reconstruct global surface temperatures of the entire Holocene. It's tricky. One of the hardest things is getting an indication of what has happened in the southern hemisphere. There's not much land down here compared to the northern hemisphere and the seas are deep. Still, intrepid scientists have been putting the pieces of the puzzle together. The PAGES 2k Consortium has been working out past temperatures in different parts of the world, and reporting other aspects of past climates. It's an ongoing project. Marcott13 was a reconstruction that caught the eye of the denialati. I don't know what it was that they didn't like about it but I think it still holds the record for the greatest number of protest articles from deniers in the shortest amount of time. Probably the fact that it showed how warm it's starting to get these days, compared to the past, didn't endear the work to the denialati. 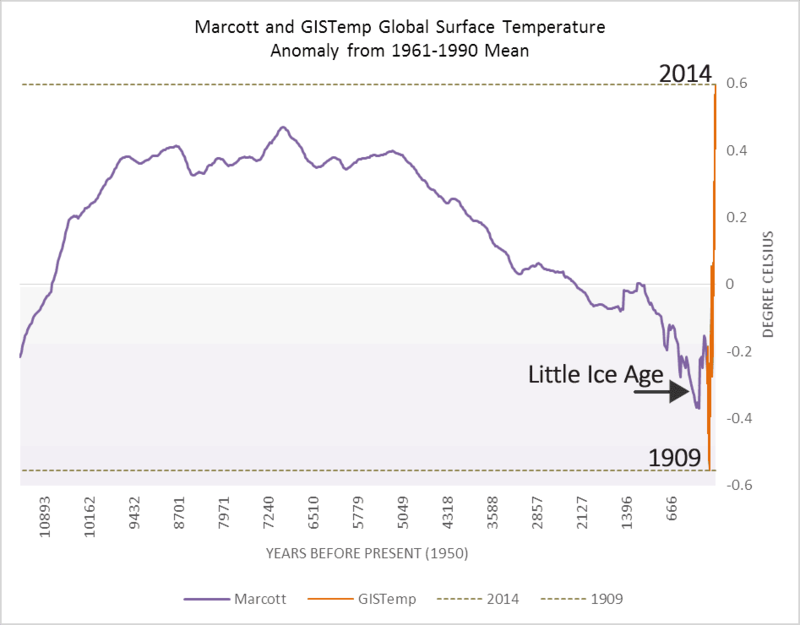 Here is a chart of the Marcott reconstruction together with temperatures of the instrumental era (GISTemp), all as an anomaly from the 1961 to 1990 mean (which is the base year for Marcott13). The highs and lows of the instrumental record can't really be compared directly to Marcott13, because the former is annual while Marcott13 has a much coarser resolution - decades to centuries. What is fairly clear is that early last century was very cold and now it is very hot by comparison with the Holocene as a whole. You can see the Little Ice Age to the right of the chart, not long before the modern instrumental chart. It looks to have been the coldest period in the Holocene by a large margin. It's not possible to tell from the Marcott reconstruction whether the planet is now the hottest ever since civilisation began. There was a warm period around 8,000 years ago. However we must be getting close to the hottest and have probably by now exceeded it. And it will only get hotter over the next few decades, particularly if we keep burning hydrocarbons. Tim Ball claims (I can use that word too) that the current global surface temperature is now no higher than the coldest 300 years of the past 10,000 years. The chart above shows just how far off the mark is silly old Tim Ball. Look at the 2014 temperature and then compare it to the coldest period - the Little Ice Age. Tim is doing a Don Easterbrook (whatever happened to Denier Don?) and claiming (there I go again) that the surface temperature at a particular site on the ice sheet in Greenland is identical to the average surface temperature of the entire world. Now I for one thinks he needs to get out more. Perhaps he should go to Bangkok and see if the temperature there is really minus 30°C. He'll find it's a tad warmer and a lot more humid than it is on the top of an ice sheet in Greenland. It's around 60°C hotter than the ice sheet in Greenland. 2014 is as cold as the coldest years of the Little Ice Age! What? We were told in October, before 2014 was over, that it was heading toward being the warmest year on record (Figure 1). The visual link of Polar Bears underscored the message. In fact, 2014 was among the coldest 3 percent of years of the last 10,000, but that doesn’t suit the political agenda. To be "among the coldest 3 per cent of years of the last 10,000" would make last year among the coldest 300 years of the last 10,000. Let's think about that. Since the end of the last ice age, about 10,000 years ago, global surface temperatures have probably fluctuated by little more than 1°C. Some fluctuations have lasted several centuries, including the Little Ice Age which ended in the nineteenth century and which appears to have been global in extent. The limited available evidence from proxy climate indicators suggests that the 20th century global mean temperature is at least as warm as any other century since at least 1400 AD. Data prior to 1400 are too sparse to allow the reliable estimation of global mean temperature. 1. The instrumental data is spatially and temporally inadequate. Surface weather data is virtually non-existent and unevenly distributed for 85 percent of the world’s surface. See how he's contradicted himself already? He says that the instrumental data is inadequate (he's wrong of course). This contradicts his certainty that this year is at least as cold as the coldest 300 years of the Little Ice Age. UHI was discovered centuries before the first climate science denier was born! The UHIE was one of the first challenges to the claim of AGW evidenced in the instrumental record. Two graphs produced by Warwick Hughes were the most effective and appeared in 1991, shortly after the first IPCC Report in 1990. An additonal issue or uncertainty about the derived global temperature change is the following: How much of the change is a result of the growth of urban heat island effects? There is abundant evidence that the growth or development of urban areas is a significant contributor to local temperature trends [Mitchell, 1953; Landsberg, 1981; Cayan and Douglas, 1984; Karl, 1985; Kukla et al., 1986]. All of these pre-date any fake sceptic cries of "UHI, UHI, UHI". Deniers often get their wrong science from distorting what little they learnt from the real sceptics (scientists). They then fake it, as if they were the ones who discovered something new. When not only did they not discover anything new, they can't even apply what they did discover properly. That doesn't apply to Tim Ball. He is not a climate scientist and he wouldn't even qualify as a fake sceptic. He falls far short. He is a conspiracy nutter of the anti-Semitic New World Order/One World Guvmint type. Akin to Jo Nova and the Galileo Movement crowd. Some form of the title for this article could work. “2014: Among the 3 percent Coldest Years in 10,000 year.” Figure 10 shows the Northern Hemisphere temperature for the period variously called the Climatic Optimum, the Hypsithermal, and the Holocene Optimum. Let me draw your attention to the Y axis on both charts. Tim's chart has the summit of an ice sheet in Greenland showing above freezing temperature. Quite a way above. Surely enough to melt the ice sheet some. By contrast, the scientists from whom Tim's source claims to have got the data show the temperature between minus 35°C and minus 28°C for the entire 10,000 years. Do you think Tim Ball believes that the entire surface of the earth has an average temperature in the minus 30s? That the earth is covered in an ice sheet and all the oceans have frozen over? Or perhaps Tim really thinks that the GRIP site in Greenland has had a surface temperature ranging from 0°C to 7°C for the entire Holocene. Or maybe that the average surface temperature of Earth ranges from 0°C to 7°C. After the termination of the glacial period, temperatures increased steadily to a maximum of 2.5°C warmer than at present during the Climatic Optimum (4,000 to 7,000 years ago). The key phrase in the 2014 claim is, “in the record”, but that only covers approximately 100 years. In the climatologically meaningful 10,000-year context, it is among the coldest. If there was any sense in that (which there isn't for several reasons), it would be the equivalent of claiming the world is boiling over because the weather in the Simpson Desert has been rather warm of late. 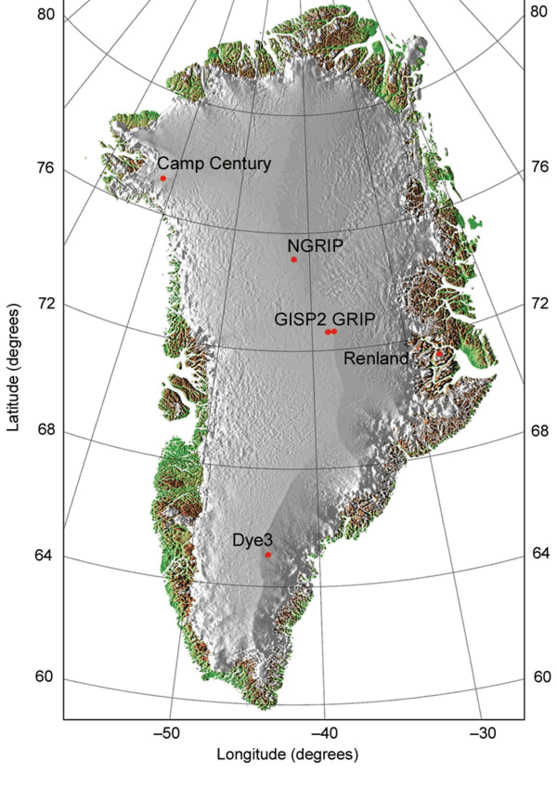 Here's a map of Greenland showing the site of GRIP. It's way up high on the summit of the ice sheet. Slap bang in the middle of Greenland. It must be one of the coldest spots in Greenland (and the world). You'll also probably be wondering why Tim is quoting some denier who is quoting a paper in Science mag. Why didn't he just go to the paper directly? Well, deniers have a curious tendency to only quote other deniers. They probably think they'll get infected with science if they read an actual scientific paper. Besides, it gives them an "out" when they misquote and misrepresent the paper they are writing about. They can say that they "only" repeated what someone else repeated, who was only repeating what some other denier was repeating, who was only repeating what some other denier was repeating etc. You might also wonder if Tim explored any more recent papers. (No, I know you're not really wondering that. Tim wouldn't.) Anyway, here is a chart from Kobashi et al 2011. 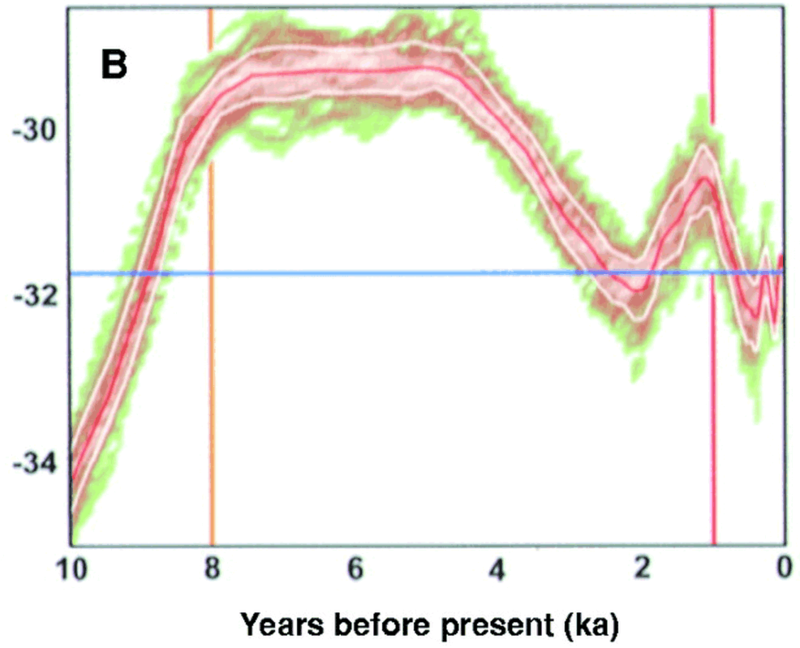 It's a reconstruction of Greenland temperatures of the past 4,000 years only. So it doesn't include much of the Holocene climatic optimum or whatever you want to call it. ...Greenland temperatures of the past 1000 years were found to be significantly correlated with Northern Hemispheric (NH) temperatures (r = 0.35–0.44; depending on different NH temperature reconstructions) with an amplitude 1.4–2.3 times larger than the NH temperature likely owing to polar amplification [Kobashi et al., 2010]. So you'll see that the temperature trends in Greenland do correlate fairly well with Northern Hemisphere temperatures of the past 1000 years, although they have a lot bigger ups and downs. And in the past couple of centuries it's diverged from the global trend. The claim that 2014 was the warmest on record was politically important for proponents of the Intergovernmental Panel on Climate Change (IPCC) story that human CO2 was causing global warming. Central to that argument was the need to prove late 20th century temperatures were the “warmest ever”. This is why the 2014 claim conveniently appeared before the Conference of the Parties (COP) meeting in Lima Peru, at which the false IPCC claim was desperately promoted. Political importance of the measure was accentuated by the continued, 18+ years lack of increase in global temperature. Tim cannot leave off his tin foil hat for more than a moment. Remember he thinks that climate science is a plot hatched by some Jewish bankers in the 1800s, or something like that. He tends ot mix up his paranoid conspiracy theories so one is never sure which is his conspiracy theory of the day. And at risk of temperature overload - here is a temperature anomaly chart showing what it was like in Tim's 18+ years ago - or 18 years before last year, which would make it 1996. The world has got a lot hotter over the past 18 years. The mods are slipping at WUWT. They've allowed a couple of normal people in, to poke fun at the idiocy that deniers mistake for "science". Complains that “The instrumental data is spatially and temporally inadequate” and then relies on Greenland Ice Core temps to prove The whole Earth has been a lot warmer in the past 10,000 years. Got it. It is just fantastic. This could be a classic. Surely beats the interpolation in gistemp. Bob Boder isn't impressed with the mirth. I don't know if Tim's idiotic article impressed Bob or not. wow you let icouldhelpit beat you! how much did that cost you to be second. whiten decides it's time for a lecture on the difference between climate and weather. Apparently one year (2014) is climate and not a yearly cycle when compared with 10,000 years of weather. Or is it the other way around? Maybe 2014 is only climate if Tim Ball compares it (badly) with the last 10,000 years. Otherwise it's just a yearly cycle. Or something. Yes rooter it is fantastic…..especially while it shows that people like your self can not distinguish between climate and weather, or yearly cycles. Estimating and evaluating the particular 2014 in the format of 10,000 years is a climatic evaluation. I know this make no heads or tails for you thus far….be patient. A climatic evaluation or estimation is not calculated only on temp variations,….. like the measured amount of warming or cooling during the year…..but actually through the CS metric…. the amount of temp variation in accordance to CO2 emissions. Whatever value of CS you fancy, according to the reality this is the higher CO2 emission-concentration year for the last 10,000 years with an amount of warming that makes this year with the less ever “amplifying” of warming, meaning that the 2014 regardless of so much CO2 in atmosphere shows no “amplifying” and therefor showing that there is no warming whatsoever but actually the climatic signal is one of cooling, to the extent of it been the higher COOLING CLIMATIC signal for this year than any other year for the last 10,000 years. Sorry but you know we have this thing the CS you know, and it has a meaning and a use for, is not a figment of imagination…….it is the main climatic metric, for better or worse. So in the climatic estimation, like when you say the warmer or colder year ever (evah), or for any time with a length beyond a 100 years, this year belongs to the 3% of the coldest years for the last 10,000…..actually with a very very high possibility of it been the coldest ever (evah) for the last 10,000 years. In a weather or yearly or even a decade time span estimation… it could be whatever you or any one else fancies to be….and I would not really care, as I my self more interested in the climate and climate change than weather……..But when claiming an estimation in the bases of the term “since the records began” than you are in a climatic estimation by default, so to speak. So no matter how many record warming years you have according to the simple weather or yearly cycles estimations, or how many such record years you may “produce”, it does not really mean anything in climate terms,…………… that is why these crazy records make not even a dent to the plateau or the hiatus…or put another way….these record years can not give you back that large amount of the missing heat, no matter what, because that is all to do with climate and not weather……. hope this is not very complicated in principle..
Oh, sorry about that. I was only going to post part of that comment, but it just kept getting better and better. The short version is: 2014 isn't climate except when Tim Ball says that 2014 is as cold as the coldest 300 years in the Little Ice Age. Otherwise, 2014 is just weather. And lots and lots of record hot years in succession without any record cold years doesn't mean the climate is changing. And anyway "hiatus" and "missing heat" - so there! Hey root/pit! You two have quite a dynamic-duo, tag-team act going here! My compliments! And since you two puckish hive-wits are obviously the hive’s go-to-guys for smart-lip snark (not to mention your unequaled skill at positioning your opening comments at the very tippy-top of the comments section of “denier” posts (again, my compliments)), let me ask you two, knee-slapper-genic pros to help me out a bit, by allowing me to draw on that special, snot-nosed, dork-humor gift of yours. Tell it to Phil Jones – he insists you can determine the temperature of the Southern Hemisphere to an accuracy of one-thousandth of a degree on the basis of one thermometer. Bob Boder imitates Anthony Watts, who often jumps down Nick Stokes throat without any provocation at all, and accuses him of being paid to "troll" at WUWT. (Nick, who has the patience of a saint and is always polite and on point and rarely gets ruffled. And who is willing to spend some hours helping out a fake sceptic when asked. One of the very few people that Anthony desperately needs to keep on side for that touch of normality.) I mean they have a point. It does take a lot out of one to read the tripe and try to inject a little science sense into the nonsense there. Man you must really like your job! how much do you get paid to be the first one to post on every single article? Either you are really desperate for cash or trolling pays really well. let me in on who you are connected to I could do a great job of sound like fool for the right amount of cash. Sorry, but I would prefer to see figures with clear captions (and references) that stand on their own. These blogs seem to often be hastily written and posted, with poor attention to detail and technical writing standards. This site could really use an editor (I understand Anthony cannot do it all himself). I suggest you take time off from the hair-splitting, conspiracy theorizing, and sophistry to take a trip up north in Canada or Alaska, where the warming is undeniable even to the most skeptical observer. It may be warmer, but aren’t you missing the point? Warmer than what? Any of the last 100 years, or any of the last 10000 years? Which is most important? So prove we had anything to do with it. More here. Like I say, this sixth (or is it the seventh) protest article provides a lot of psychological insight into the weird world of deniers. 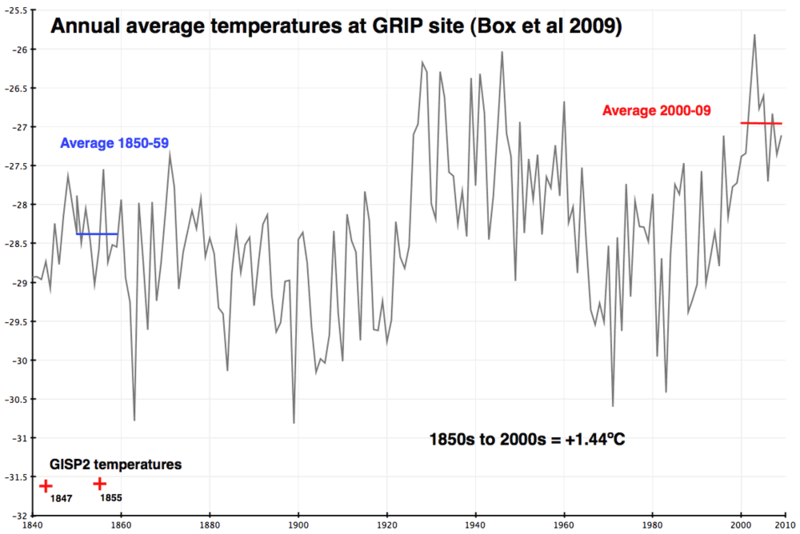 Here is the temperature the last one-and-a-half century at the GRIP site, up to 2009. Note that temperatures the last decades were about 1 degree higher than the previous decade, which is the decade that I presume Dahl-Jensen et al (1998) is referring to when they write "present". So that would put present temperatures at level with much of the past 10,000 years..
Richard Alley talks about what we can learn from Greenland ice cores at Dot Earth. "So, using GISP2 data to argue against global warming is, well, stupid, or misguided, or misled, or something, but surely not scientifically sensible. And, using GISP2 data within the larger picture of climate science demonstrates that our scientific understanding is good, supports our expectation of global warming, but raises the small-chance-of-big-problem issue that in turn influences the discussion of optimal human response." I think it would be for the best if you didn't use the "0.36 C in the last 18 years" graph that highlights the difference between the individual annual temperature anomaly for 2014 and 1996. I'm surprised no one has called you on it yet, and I think this the second article where it's been used. It's pretty meaningless when "they" do it and no less so when you do it. It's entirely valid to use it in response to the claim there's been no warming in 18 years, and Sou isn't using it for anything else. Appreciate your thoughts, MarkB. The linear trend says it better but not so emphatically as clearly comparing the two years on the chart. I was making a strong point that it's warmed quite a lot in the last eighteen years. Only a denier would talk about "18+ years lack of increase in global temperature". I do not understand MarkB's point either. Sou is not doing a "peak to peak" comparison. If Sou wanted to cherry pick some peaks and dips, she could have made the increase look more than 0.36C. MarkB does have a point and when I'm not being snarky I talk about trends rather than making year to year comparisons. 1996 is a tad below the trend line (from 1971 to the present) but not by all that much much. 2014 is sitting right on the trend line. For comparison the linear trend from 1971 to the present is 0.166C/decade, equivalent to 0.3C over the 18 years since 1996. I'm curious about our comment on "they". Who are "they" and where have "they" shown that 2014 was 0.36 degrees Celsius hotter than 1996? I'm speaking to the mis-informer tactic of, for example, subtracting current year from a particularly warm (usually 1998) previous year and claiming "no warming" or "cooling". Of course that can't be done with a record setting year like 2014, so I'd hoped to be spared from seeing it for a year. Not a big deal, but I'd prefer staying on the scientific high road. I've been seeing the Jensen paper kicked around and misrepresented quite a bit in the wild lately. Most notably by Rick Cina over at Livescience. "this year belongs to the 3% of the coldest years for the last 10,000…..actually with a very very high possibility of it been the coldest ever (evah) for the last 10,000 years." A large number of people writing comments at WUWT seem to be paid by Greenpeace. You mean paid troll commenter to make it look like the website's readers are complete idiots?